This is the Swiss Army Giant by Wenger knife company. It costs $999.95. Here’s what is on this monster: (if you get tired of looking at the options just skim to the bottom) Can Opener, Corkscrew, Key Ring, Large Blade, Large Serrated Locking Blade, Magnifying Glass, Nail File, Needle Nose Pliers, Phillips Screwdriver, Reamer, Scissors, Small Blade, Toothpick, Tweezers, Wire Cutter, Wood Saw,Â 10mm Hexagonal Key for Nuts, Bit Phillips #0, Bit Phillips #2, Cap Lifter, Chain Saw Rivet Setter, Chisel-Point Reamer, Clip Point Blade, Compass, Cupped Cigar Cutter, Divot Repair Tool, Extension Tool, Fiber Optic Tooi Holder, Fine For for Watch Spring Bars, Fine Metal File, Fine Screwdriver, Fish Hook Disgorger, Fish Scaler, Flashlight, Flat Head Screwdriver Bit 0.5mm x 3.5mm, Flat Head Screwdriver Bit 0.6mm x 4.0mm, Flat Head Screwdriver Bit 1.0mm x 6.5mm, Flat/Phillips Head Screwdriver, Golf Club Groove Cleaner, Gunsight Screwdriver, Laser, Line Guide, Locking Flat Nose Pliers, Locking Screwdriver, Magnetized Recessed Bit Holder, Metal File, Metal Saw, Micro Scraper – Curved, Micro Scraper – Straight, Micro Tool Adapter, Micro Tool Holder, Nail Cleaner, Phillips Head Screwdriver 1.5mm, Phillips Head Screwdriver Bit 1, Pin Punch 0.8mm, Pin Punch 1.2mm, Pliers, Removable 4mm Curved Allen Wrench, Removable 5mm Allen Wrench, Removable Screwdriver Bit Adapter, Removable Screwdriver Bit Holder, Removable Tool For Adjusting Spokes, Removable Tool Holder, Round Needle File, Ruler, Screwdriver 0.8mm, Screwdriver 1.2mm, Screwdriver for Slotted & Phillips Head Screws, Shoe Spike Wrench, Shortix Laboratory Key, Snap Shackle, Telescopic Pointer, Tire Tread Guage, Universal Wrench, Watch Opener, and Wire Crimper. Can you imagine trying to carry this monstrosity in your pocket, or in a case on your belt, or even tied to a sling around your neck. There is simply too much stuff on this knife for it to be practical. When was the last time you needed aÂ Fish Hook Disgorger,Â Cupped Cigar Cutter, or aÂ Watch Opener. Often times in ministry we keep adding things to what we are doing. We do it with good intentions of trying to help others, help ourselves, or the team as a whole, but our load gets heavier, and heavier, and heavier. Eventually, like the Swiss Army Giant we are trying to do too much, and are not practically good for anything. This knife is something you keep on your desk to show people when they visit. Its’ a novelty, something to laugh at because it is ridiculous. So how do we keep this from happening in our lives? 1) Decide how many “blades” or ministry objectives that you can manage at one time and still remain “sharp” and functional. This number will vary depending upon gifting, experience, and the size of your team. The blades/tools that you choose to put in your knife will determine the direction your ministry will take. The “Telescopic Pointer” is cool, I think I will really use that one. 2) Be ruthless about getting rid of everything else. If you allow it back into your life it will only make you less and less effective in what you do. Like adding more and more “tools” to the Giant, your ministry will become more and more impractical. Do you have a “Micro Tool Holder” in your life that you need to get rid of? 3) Say no. As gracefully and tactfully as you can, say no to things that really don’t fit what you do, or where you are want to go. The “Watch Opener” really is not the right tool for me, so I am not going to allow it to be added to my ministry knife. By saying no today, you can say yes to other things, and to spending time on the things that will bless others because you are using the right tools that fit you. Just say no to the “Curved Micro Scraper” of ineffectiveness. Now that you are streamlined, sharp, light weight, and highly functional, get out there and be a tool. 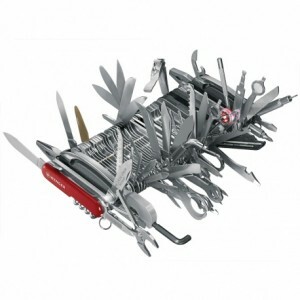 Wait, let me put it another way; I tool the swiss army knife analogy too far. Get out there and make a difference!